Jörg makes cutting awesome ! 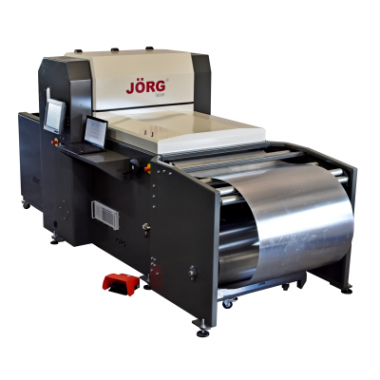 Jörg introduces a new Coil Fed Laser cutting machine: Type 2020 Compact. This machine design is very useful in smaller workshops. Because of its smaller footprint, less laser power and lower price. The straightener is build in the cutting machine, so the machine is working without a loop. The compact design and the use of only first class components makes this a very reliable machine. Using special selected software by Jörg makes it a very powerful coil fed laser-machine for cutting sheets for insulation sheet metal and HVAC. Cutting steel, galvanised steel, aluzinc, stainless steel, stucco, plastisol, aluminium, etc. at high cutting speed. High cutting speeds, up to 15 m/min, accuracy +/- 0,2 mm, including holes. All shapes that can be drawn can be cut. Low consumable costs, because there is no contact with the material during cutting. Low maintenance and acceptable energy consumption due to the use of the IPG fiber laser which is one of the best. High material efficiency due to optimal nesting. The products remain attached only by tiny micro joints, allowing them to be separated easily. Low noise level when the machine is in operation. The sheet is constantly clamped in a pneumatic clamps which moves the sheet backwards and forwards on a linear drive with spindle. This results in a high positioning accuracy and reduces sheet crashes. Where it is common to cut using nitrogen cutting gas, we have excellent experience with compressed air, which is much easier and more economical in its use and environmentally friendly. Working widths of 1020 and 1270 mm available. Due to optional equipment, the machine can be supplied customer specifically. The JÖRG Compact Laser cuts directly from coil. This increases the material used efficiency, and the sheet supply to be efficient. In addition, the length of the products to be cut is not limited by the machine. By using more decoilers, it is possible to quickly switch materials. 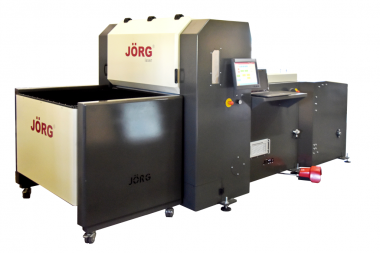 The JÖRG Compact Laser is equiped with an IPG Fiber laser. The capacity of the source is tuned to the material to be cut. Advantages of the fiber laser: high cutting speed, low energy consumption, dross free cutting and less maintenance required. Insulation cladding, air duct fittings, thin sheet: steel, stainless steel, aluminium, copper, zinc, etc. Suitable for serial production, high volume production, production of complex nested parts and can be used as a replacement for punch lines. Optional software for efficient management of the production of air ducts, insulation cladding, and similar products: developing, nesting, and programming. With extensive database of standardised products.